Leicester were knocked off top spot with a defeat by managerless Crystal Palace that ended their 100% home run in the Championship this season. 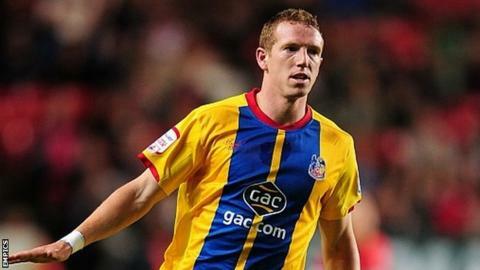 Damien Delaney fired home the opening goal from 12 yards before Peter Ramage headed in Yannick Bolasie's cross. The Foxes created few chances as Palace made light of the departure of manager Dougie Freedman to Bolton to extend their unbeaten run to 10 and go fourth. Andy King's stoppage-time header was only a consolation for the hosts. The visitors, under the stewardship of caretaker boss Lennie Lawrence, could have gone ahead in the first minute but Bolasie spurned a chance from close range. Julian Speroni - making his 250th league start in goal for the Eagles - had to be at his sharpest to save a David Nugent effort as the Foxes briefly threatened at the other end. Palace took the lead after 23 minutes when Kaspar Schmeichel failed to deal with a Mile Jedinak corner and Delaney lashed home the loose ball. Five minutes later, Ramage stole in unmarked to power home a header from six yards. Leicester's performance improved slightly after the break and Jamie Vardy should have done better with a header that sailed over the bar. But the goal did not arrive until the second minute of stoppage time when substitute Ben Marshall's cross was crisply headed past Speroni by King. Palace's win moves them to within one point of second-placed Leicester. Leicester manager Nigel Pearson: "Too many of our lads failed to find the form they have shown so far, but what we never did was to down tools. They're an honest bunch and they kept going. "When you concede two goals in five or six minutes it makes a big contribution to any match. Today we didn't quite have the quality we needed to get back. We huffed and puffed without quite finding our feet. "We have done exceptionally well so far this season but were beaten by a good side. "We will now pick ourselves up for two tough away games at Watford and Bolton. I'm disappointed we've lost top spot, but I won't be dwelling on it for too long." Crystal Palace caretaker boss Lennie Lawrence: "We knew exactly how difficult it would be at Leicester who will be in the top six at the end of the season without a shadow of a doubt. We had a game plan and it worked. "We started boldly and scored two goals whereas at Barnsley we just got one. We knew they'd throw everything at us and they did but we defended resolutely, Julian Speroni made some saves and we rode a few moments of luck. "Whoever takes charge will have a side that has every chance of maintaining a play-off challenge. They are so good as a unit, they could probably run themselves for a week or two. "They have been absolutely spot on since Dougie left - if they weren't, you could never come to a place like this and win."